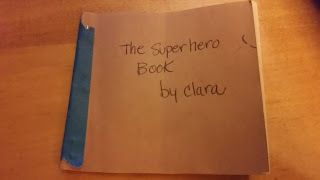 Clara's preschool class has recently been working on making their own books. 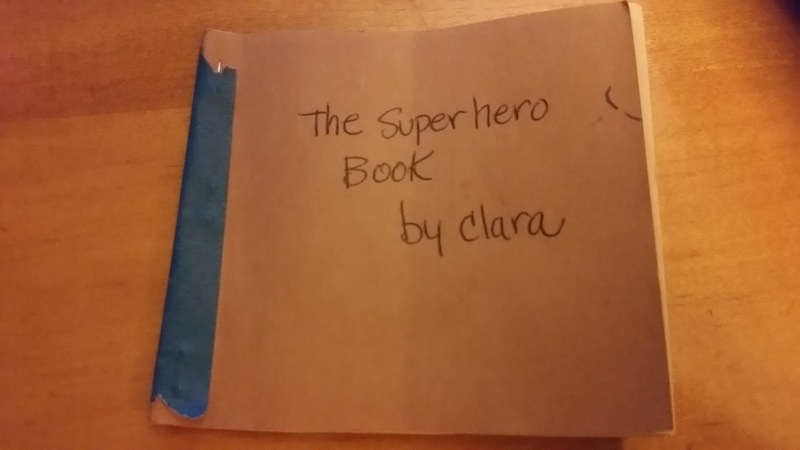 The kids are crazy about it and I have been "gifted" with a number of scribbled books by Clara. This week, Clara brought home a new book, this time with a twist. Clara got to describe what was happening and her teacher dutifully took notation. I present to you: Clara's first "book." 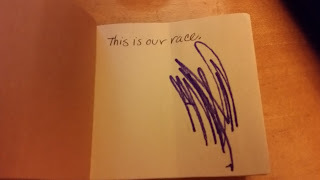 p. 1: This is our race. p.2 Then we went to the pool. 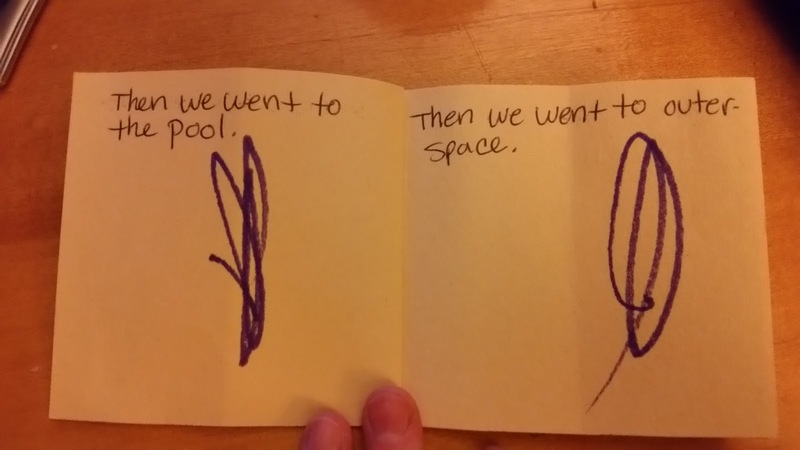 p.3: Then we went to outer space. p.4:Then I just writed everything. p.5: Then we went to the ocean again. 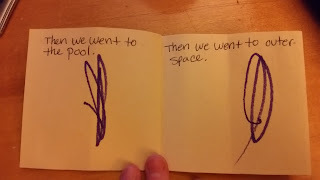 p;6: Then we went to the pool again. p.7: We just went home again. p.8: Then we did everything. This is a race that is happening SO fast that all we can see are blurry, purple scribbles. I don't know about you, but that clearly puts this in superhero territory. Then we went to the pool. Then we went to outer space. When was the last time you went to the pool AND then went to outer space in the same day? Also, last time I checked us mere humans have to use a spaceship to get to outer space - all this superhero needs is a purple scribble-oval. BAM! Superhero! Then I just writed everything. Then we went to the ocean again. Have you ever tried to write EVERYTHING? If I did that it would take me the rest of my life and I STILL wouldn't be done. This little superhero had time to write everything and go to the ocean AGAIN which infers that she had time for ocean swimming TWICE, while writing everything. 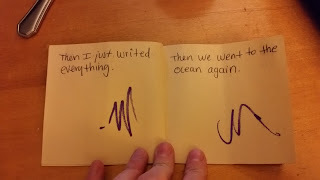 I also find it interesting that writing everything and ocean adventures look suspiciously like purple M's. Clearly only superheroes can see the nuance. 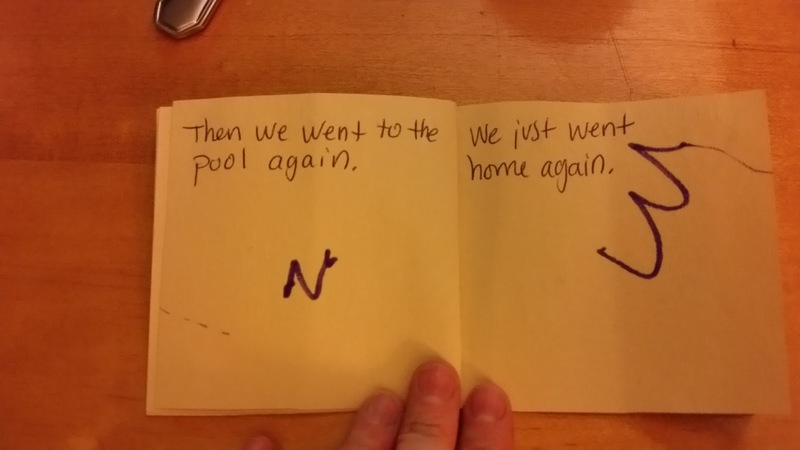 Then we went to the pool again. We just went home again. Superheroes can sure pack a lot into their day. I am glad to know that this little superhero equally enjoys the ocean and the pool multiple times over the course of the day. After all that racing, swimming, writing, and outer space adventuring it's time to go home. No rest for the weary superhero. Arriving home after a long day, the superhero is able to get EVERYTHING done. 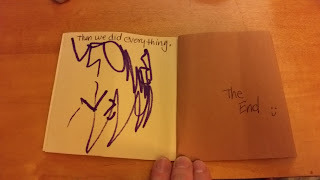 Even those purple scribbles look exhausted.